Our goal is to tell stories – and the best stories touch our emotions. However, all too often, we overlook a powerful tool that can influence our emotions: fonts. In this session, Larry Jordan looks at fonts and how to use them more effectively in conveying information and emotions in your video projects. In this session, host Larry Jordan, looks at fonts and how to use them more effectively in conveying information and emotions for your video projects. Whether you are a video editor or graphics designer, fonts are a powerful tool that trigger an emotional response in an audience. Using fonts spans all applications, as does our emotional response to fonts. 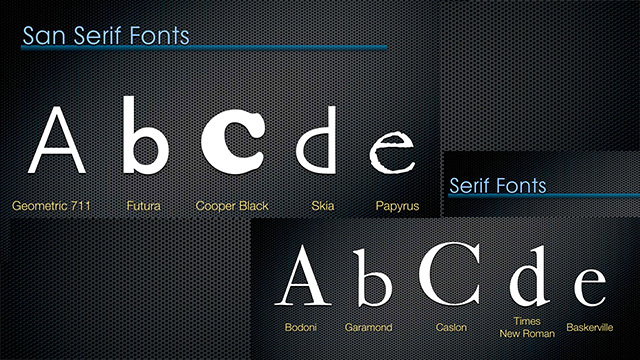 For this session, Larry uses Photoshop to illustrate how to work with fonts. However the information he covers extends to all video and image editing software. This beginning-level session does not require any software knowledge and applies equally well to anyone using fonts in any application on Windows or Mac. This session is delivered as a QuickTime movie, so you don’t need to own any specific software to watch this.